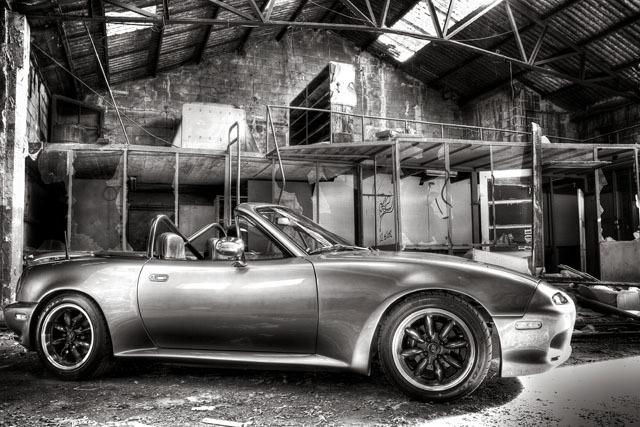 Congratulations to Ludo on the selection of The Shadow as our Featured MX5 Miata! The Shadow of Belgium It's a grey Tuesday morning. The sun is trying hard to break through the clouds of the Belgian sky. Some dry spots are becoming visual on the tarmac while in the background, sounds of race cars warming up can be heard. The Zolder racetrack is slowly coming to life as is the MaX5 Racing Paddock. 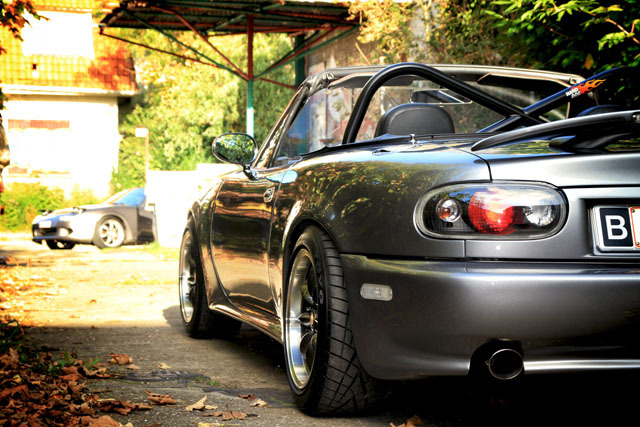 Miata's are being pulled from their covers and the smell of exhaust fumes and fresh coffee fills the air. It is there among the Mazda Cup Racers that I spot "The Shadow" for the first time. 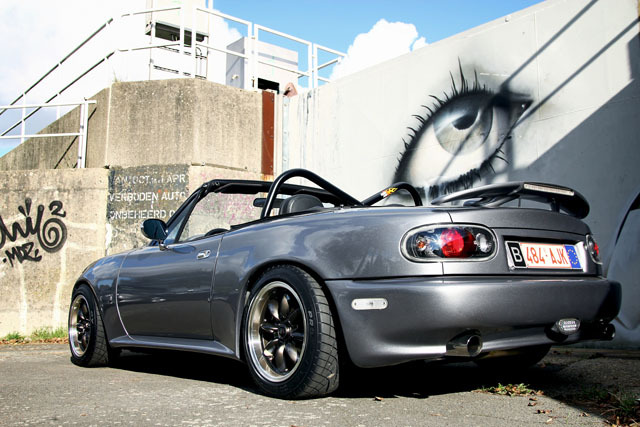 This clean NA immediately grabs my attention with it's stunning gray metallic color and spot on bodywork. A friendly voice and a big smile pop up from behind me. 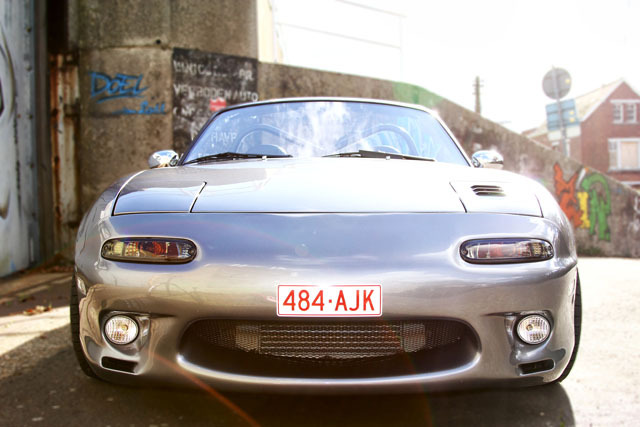 Ludo vander Vliet, the owner of the car, noticed me checking out his MX5. Even though I had been previously introduced to Ludo on Facebook we had never met before, but while shaking hands it felt like old friends got reunited. We talked a bit about the car and while walking around the MX-5 it was imminent that I needed to learn more about this NA. The morning warm up session was calling and I needed to get out on to the track. When we exchanged our goodbyes we made an agreement to meet again and do a proper shoot with The Shadow. The Shadow is the first of my two MX-5 NA’s. 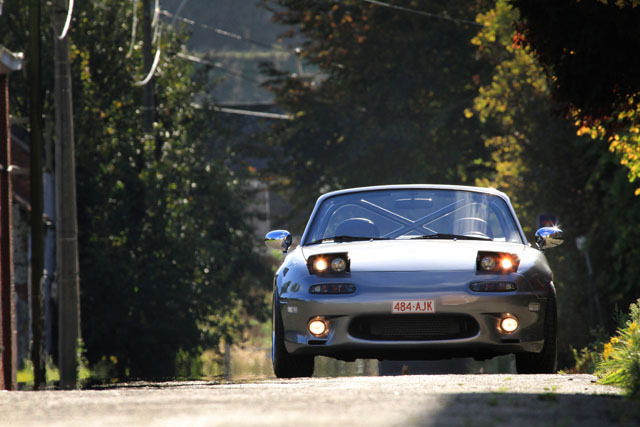 Pascal Geerts, a friend of mine, owned a green NA and had asked me to join him for a ride on several occasions. 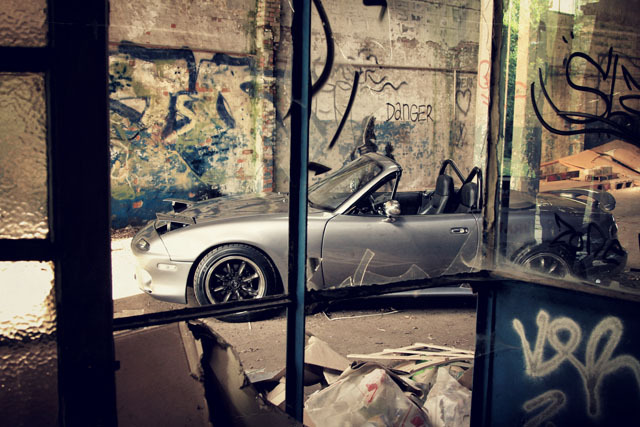 I was not really interested in the car but, on an April day in 2009, I joined him for a trip organized by the Belgium MX-5 Club. As the day progressed, being in the Mazda started to amuse me more and more and before I knew it I was behind the wheel. Pascal hardly got to drive his own car for the rest of the day! The notorious MX-5 Virus had bitten and on the way home I mentioned that the car had gained my interest. Pascal knew that there was a light gray, 1.8 for sale. 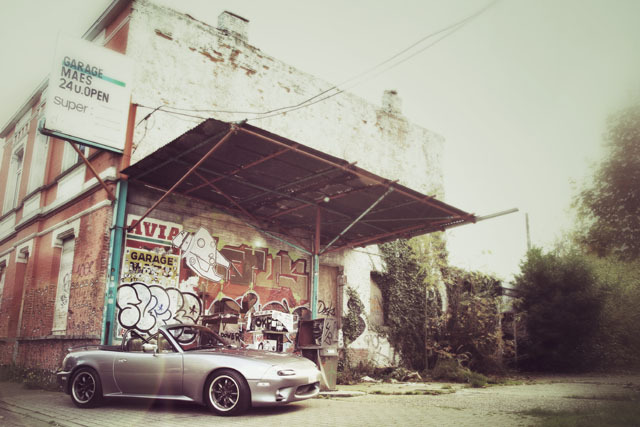 So the day after the trip with Pascal; I bought my very first MX-5. I was very happy that I got to own such a car and had hardly any idea what the possibilities of these Mazda’s were. Little did I know what the future had in store! 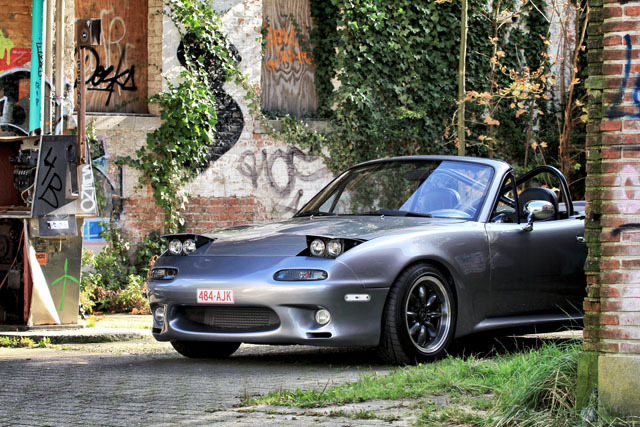 After owning the car for 7 months the MX-5 virus had gotten a lot worse and Ludo felt a strong urge to improve on his ’94 NA. First up was the exterior. Ludo had seen a great body kit on a friend’s car and so he found out about I.L. Motorsport in Germany. After checking their catalogue he placed an order and so the car received new bumpers, side skirts, head and taillights and several other parts got replaced. Even the bodyline that runs across the doors and bumpers was cleaned. Slowly the car transformed into the beast that it is today. To finish up the bodywork a new gray color was picked out of 250 different shades. Once applied to the car it turned out that the gray color transforms as the brightness of light changes. It reflects bright in the sunshine but it hides when darkness and shadows are around. And so the nickname “The Shadow” was born. Even though The Shadow was now showing of a complete new look Ludo still was not satisfied. To care about the looks is one thing but to also run a car that has power and handles well was Ludo’s ultimate goal. Shortly after the cars body make over it was time to put some grunt in the engine. 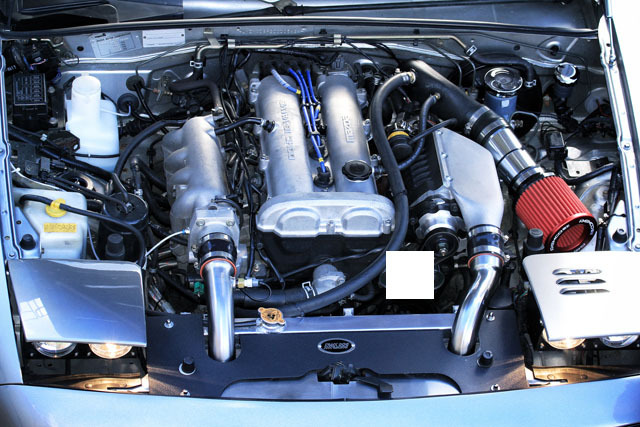 Not only did the whole exhaust system get replaced but a MP62 supercharger was installed with a smaller pulley. Furthermore some RX8 fuel injectors and a Mega Squirt computer found a new home underneath the hood. Along with various changes to gain cooler oil and better air mixtures, The Shadow slowly turned into something really quick. 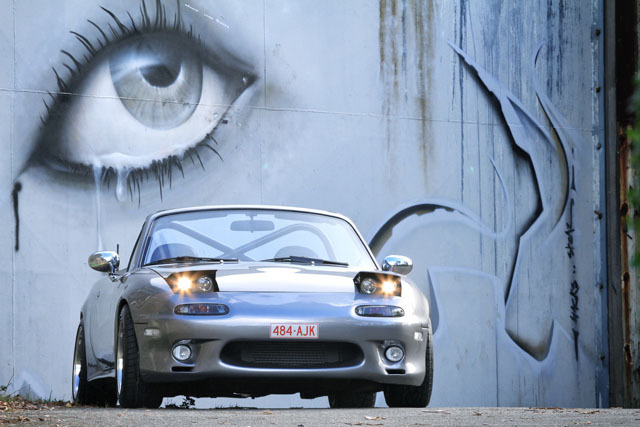 During the day of the photo shoot Ludo’s MX-5 was pushed forward by 215 BHP and 260 Nm of torque. All of which were measured on the dyno at I.L. Motorsport. 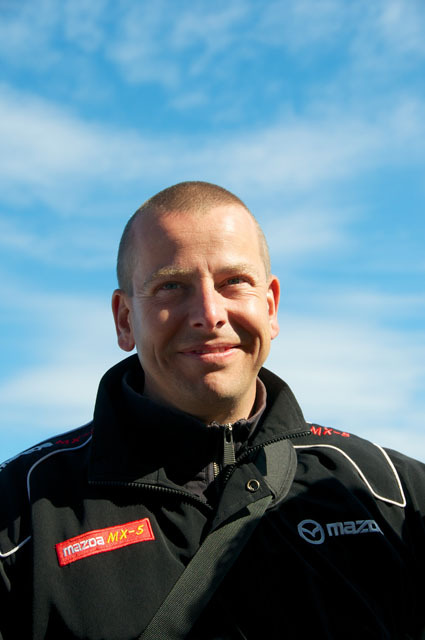 As Ludo likes both the performance and the aspect of touring with his car, he also enjoys participating in events of the MMRC. 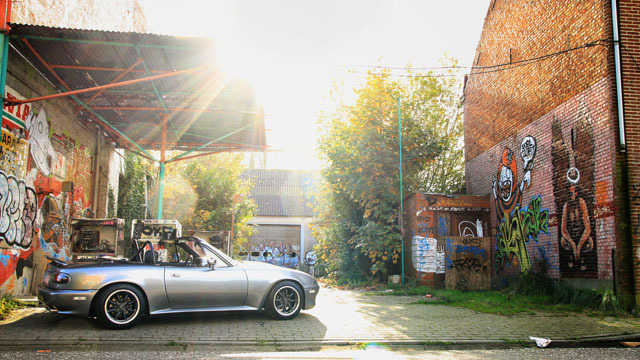 This is the Belgian MX-5/Miata/Roadster Club who organizes several events and trips throughout the year. 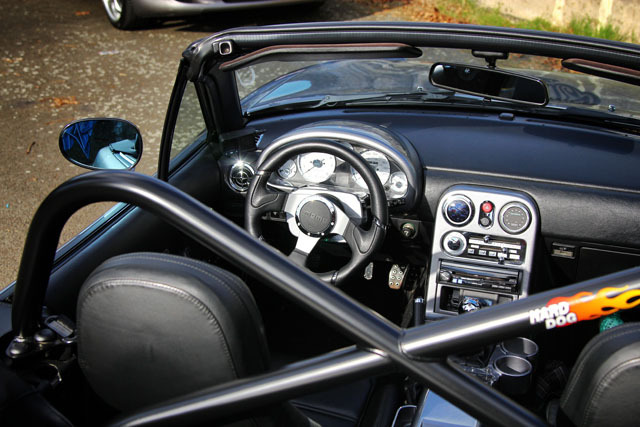 Besides just having fun with the car, the club also provides a very friendly atmosphere to hang out and have a good time friends and other roadster enthusiasts. As their events are both national and international The Shadow spends enough time being pushed through its gears on a vast amount of great roads around Europe. 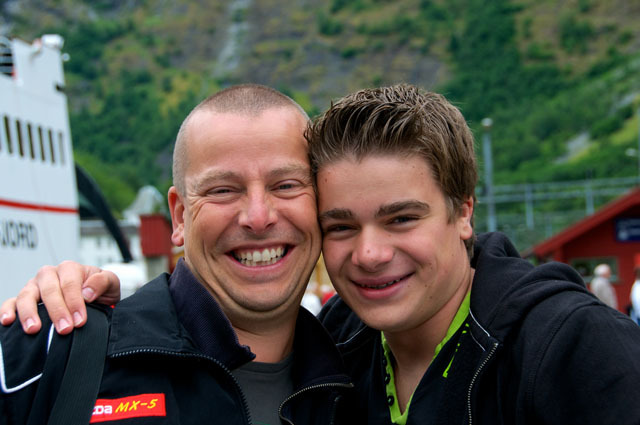 While a trip to Corsica is already being planned another journey to the North Cape is still high on Ludo’s bucket list. As all of this had not been enough, shortly after meeting up for this photo shoot, Ludo replaced the engine with a freshly build new power unit. The spec list of this motor is just too long to mention but it includes some very interesting items. 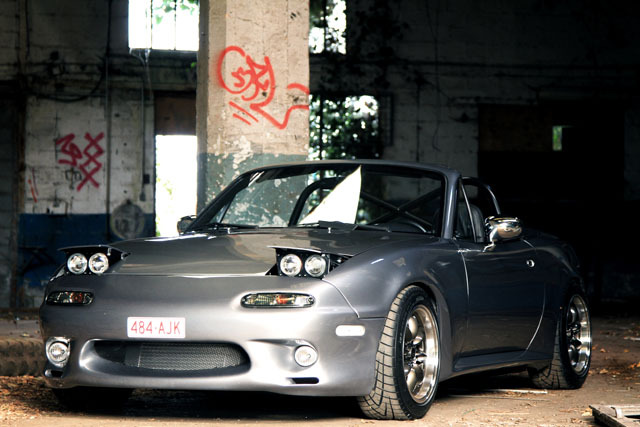 Brands such as Wiseco, Eagle, Maruha Racing, Flying Miata, Jackson Racing and I.L. Motorsport are all well represented. The latest numbers from the dyno showed a power increase towards the 228 BHP and 282 Nm of torque. With the summer around and the good weather approaching there is a big chance that you might Run into Ludo and his Shadow from Belgium. If you do; make sure you stop and say hello to a great guy and his awesome built machine.